The NBA are experts at growing internationally and domestically with the support of technology. Partnerships between the NBA and tech companies are like peanut butter and jelly, they are a good mix. Millions of NBA broadcast minutes have been distributed to fans first via AM radio broadcasts, then people upgraded to rabbit ears antennae’s and B&W televisions, next came color TV and cable, followed by wireless HDTV and mobile devices. The NBA and tech have a symbiotic business relationship. At a Starbucks business forum with Howard Shultz and Magic Johnson at Key Arena, I used up my one question for Commissioner David Stern by asking him, “How will the Internet affect NBA business?” He spent the next 20 minutes explaining the major impact cable had on league business and branding and discussed how the web was about to become the next technological difference maker for business. Stern locked in the NBA’s first cable contract and it instantly changed the league’s spiraling image. Cable television was the perfect tool for Stern to clean up the NBA brand, deliver games into homes around the nation for the first time and as a result, make owners huge profits thanks to their ever increasing broadcast rights. The NBA vision Stern had for the Internet is paying off for Commissioner Silver in record breaking video streams during the 2015 NBA Finals. The 2014 – 2015 Finals double-digit audience growth was helped by the NBA TV’s signature show, NBA Gametime. It delivered a 15% post-game coverage increase and was up 11% during pre-game episodes. A notable increase in fan eyeballs was also recorded for original programs, The Starters and NBA Inside Stuff. Across the nation, NBA Mobile witnessed a significant 75% rise in video views compare to last year. The NBA.com, NBA Mobile and Game Time App page views registered an increase of 28%. The NBA has proven and record breaking digital delivery mechanisms in place to showcase the NBA Finals, Playoffs, Draft, and Lottery, to the entire online planet. NBA self-produced content is compelling and another reason fans are streaming videos at unprecedented levels. Across the nation, NBA Mobile witnessed a significant 75% rise in video views compare to last year. The NBA.com, NBA Mobile and Game Time App page views registered an increase of 28%. The network’s live original programming up 10% during The Finals. NBA TV, led by its Finals coverage, delivering a 7% audience increase in primetime viewership through Game 6 in June. NBA GameTime recording two of its top five most viewed shows of the season during The Finals. Premiere episodes of The Starters up 19% among total viewers throughout The Finals. NBA Inside Stuff viewership up 8% for original shows airing during the NBA Finals. Tuesday’s decisive Game 6 leading to NBA Digital’s highest number of cross-platform domestic unique users this season. Across mobile web platforms, Tuesday ranking as the single best day among domestic unique users over the last three seasons. A new domestic monthly record for video streams across NBA.com and NBA Mobile in May. NBA.com, in addition to audience increases throughout The Finals, setting a new domestic site record among unique visitors in May and a 12% increase over the previous year. The NBA Game Time App delivering a 15% gain in domestic unique visitors in May over 2014. #NBAFinals tweets generating 7.6 billion views on Twitter and across the web. Facebook fans creating 173 million interactions related to The Finals including posts, comments and likes. Additionally, NBA, Warriors and Cavs content amassed a record 98 million video views, up 180% from 2014. NBA TV’s Facebook and Twitter content garnering 187 million impressions during The Finals, up 61% when compared to last year’s same time period. Content surrounding this year’s decisive Game 6 garnered 67 million impressions, 70% higher than last year’s NBA Finals clinching game. Source: Nielsen L+SD (2015 NBA Finals period: 06/01/15-06/16/15; 2014 comparison period: 06/02/14-06/17/14); (2015 June to-date: 06/01/15-06/16/15; 2014 June to-date 05/26/14-06/17/14). Adobe Omniture. comScore. Facebook Insights and Twitter Analytics. Sports on Facebook and TwitterData. 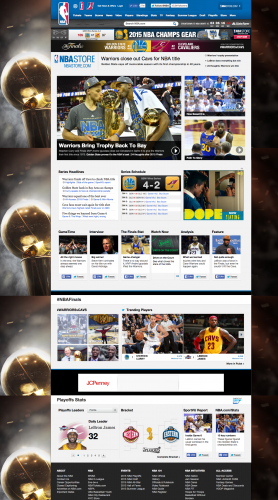 NBA Finals 2015 Sets New Global Streaming Records – Sports Techie blog. Sports Techie, The basketball world got to find out that Stephen Curry plays for the Golden State Warriors, he is league MVP and now a NBA Champion. Fans also know LeBron James plays for the Cleveland Cavaliers once again and finished playing in his fifth straight NBA Finals. Together these superstars helped their teams drive NBA web and video traffic to new levels during The Finals. Hashtag #NBAFinals was used in over 7.5 billion tweets. Facebook was alive with NBA content. The NBA and Turner Sports expanded web based viewership and social engagement numbers to new worldwide and U.S. sportsbiz highs. 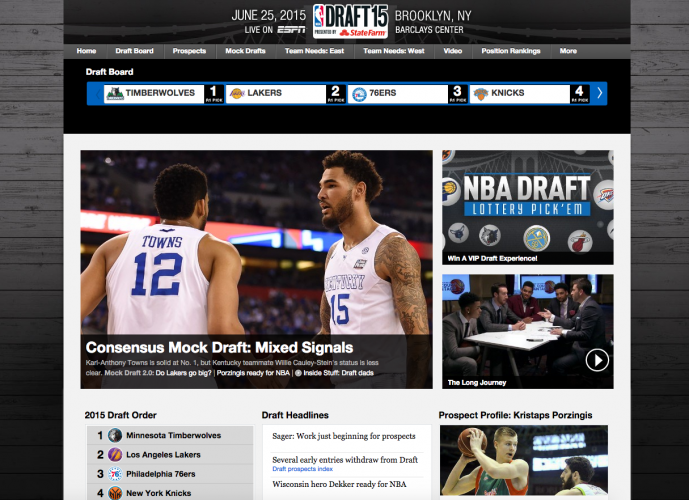 Bravo, bring on the NBA draft.